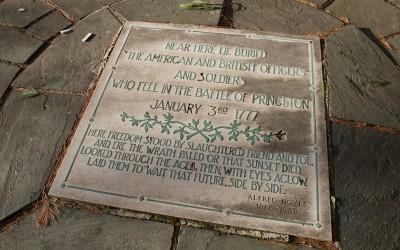 The American victory at the Battle of Princeton (January 3, 1777) was one of the most consequential of the American Revolution. 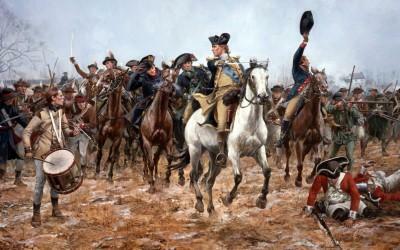 George Washington and his soldiers marched north from Trenton and attacked a British force south of the town. 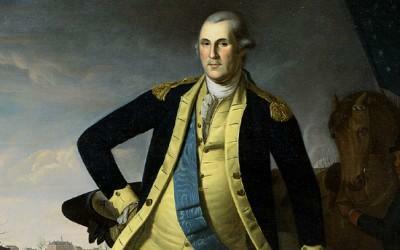 Washington's victory bolstered American morale and provided great confidence to his soldiers. 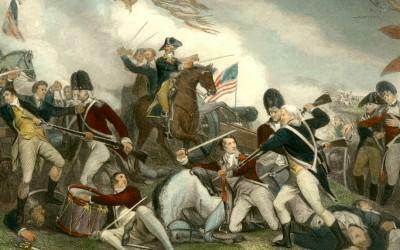 Despite their success in repulsing several frontal attacks at the Battle of Assunpink Creek (Battle of Second Trenton) on January 2, 1777, Gen. George Washington and his senior officers were filled with a sense of dread. Gen. Charles Cornwallis’ army of 8,000 veteran soldiers were poised to deliver a punishing blow the following morning. 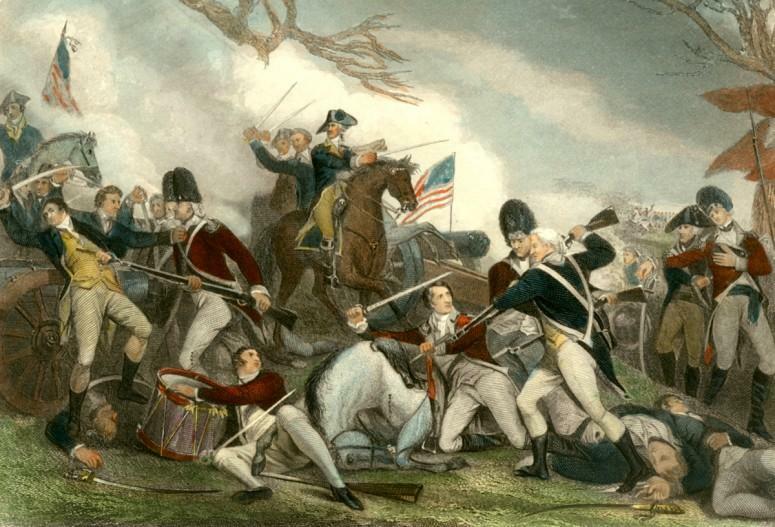 The fact that the British had discovered a ford that led to the vulnerable American right flank made the American position on the Assunpink Creek near Trenton all the more dangerous. Rather than risk defeat in Trenton, Washington, in collaboration with his senior officers, agreed upon a bold and dangerous plan. That very night the Continental army would quietly leave its positions along the creek and march east, then north towards Princeton. 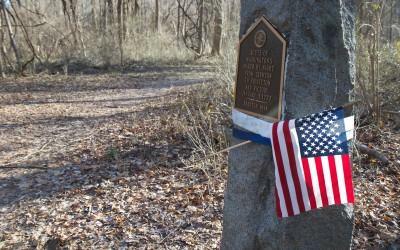 With deceptive campfires still burning along the creek, Washington’s intrepid soldiers began their 18-mile march through the dark and bitterly cold night. By stealing a march on Cornwallis, Washington retained the all-important initiative and avoided any movement that smacked of retreat. Washington’s successful night march on January 2 and 3, 1777 is remembered as one of the great flank marches in American history. 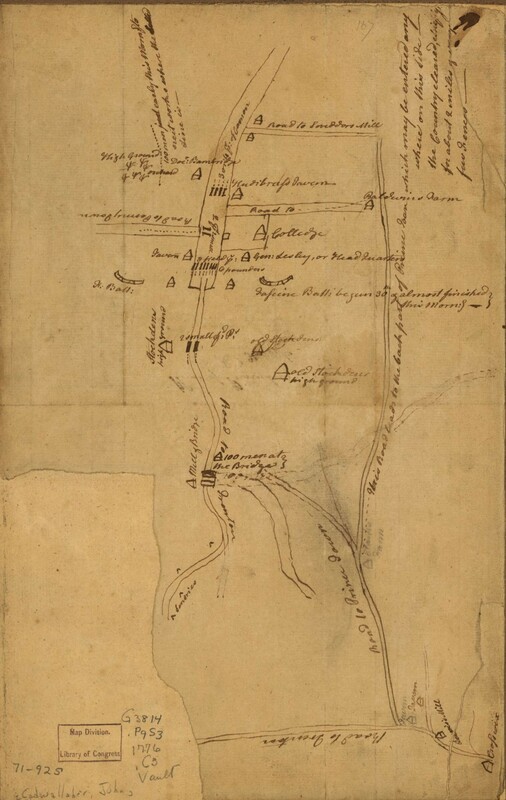 Cadwalader’s intelligence efforts bore fruit in the form of a detailed, handwritten map of the British positions around Princeton, New Jersey. Cadwalader had received this detailed information from “a very intelligent young gentleman” who had just returned from the area. Cadwalader’s map included detailed information on British works, cannon, and force dispositions. The map also included valuable information on the road network around Princeton – all information that Washington put to great use on January 3, 1777. Lt. Col. Charles Mawhood, the British officer in command at Princeton, had been ordered by Cornwallis to bring reinforcements down to his position at Trenton. 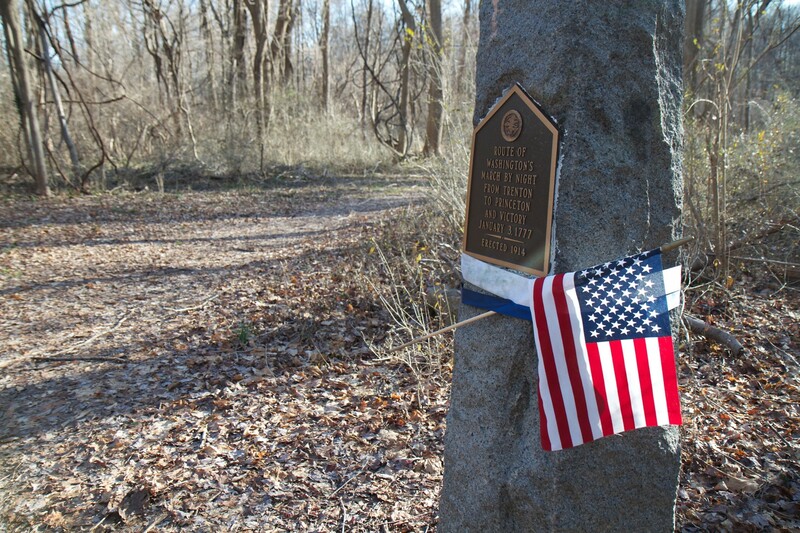 Leaving a small garrison in Princeton, Mawhood began his march down the Post Road towards Trenton just after dawn. 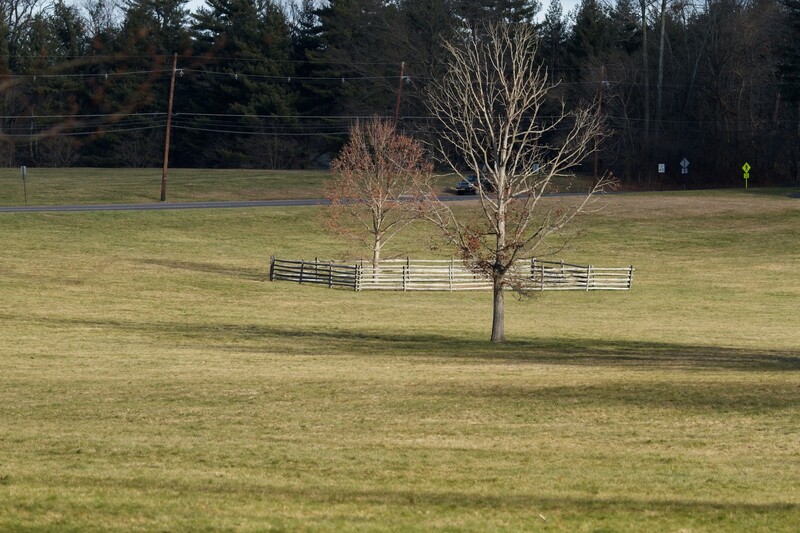 Washington’s northward marching army was primarily traveling on a parallel and lesser known road that crossed the Thomas Clark Farm – a road that was largely out of view from the Post Road. 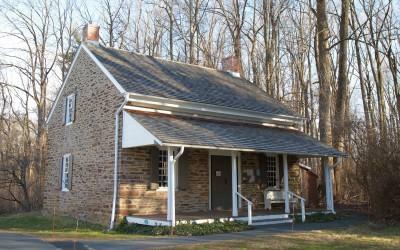 Behind schedule Washington sent a small detachment under the command of Hugh Mercer to seize and destroy the Stony Brook bridge along the Post Road. It was this detachment that was viewed by scouts attached to Mawhood’s column. 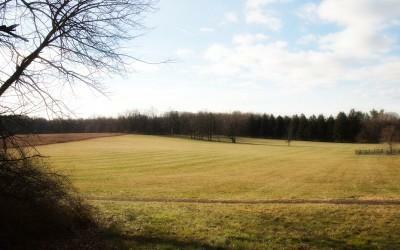 Mawhood, now aware of a new threat near Princeton, wheeled his force about and approached Mercer on the Clarke Farm. One might imagine what would have occurred if this chance meeting had not occurred. 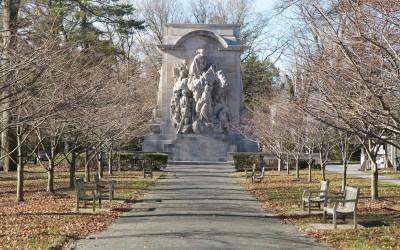 Mawhood would have been well on his way to Trenton and Washington would have found but a small, vulnerable garrison at Princeton. Mercer’s American force soon beheld the advance of soldiers from two British regiments – the 17th and 55th Foot. 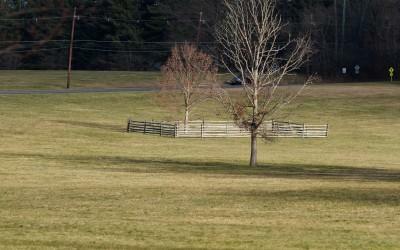 Mawhood himself could soon be seen atop his “brown pony” and with a pair of his favorite spaniels bounding at his side. As David Hackett Fischer writes, “[Mawhood] delighted in the display of a highly developed air of nonchalance, especially on the field of battle.” Despite this strangely casual display, Mawhood was a veteran and highly capable officer who would more than prove his mettle on the fields at Princeton. 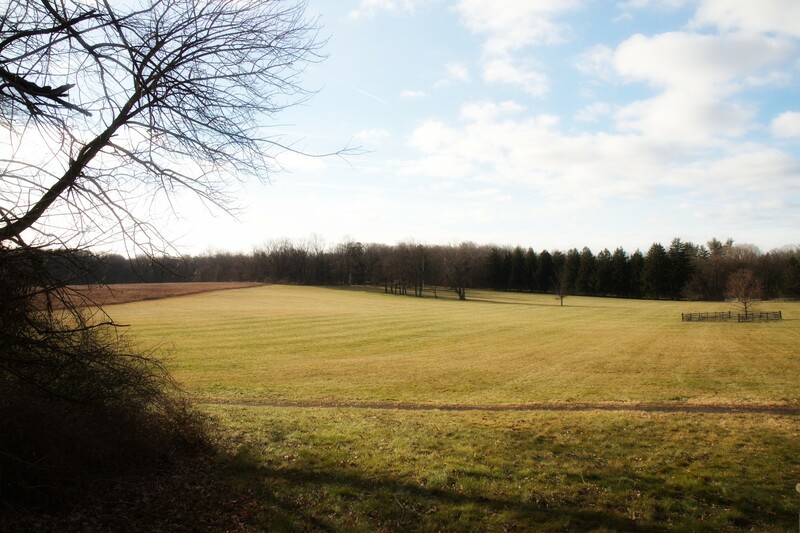 During the opening phases of the battle, a bayonet charge by the British forces broke Hugh Mercer’s American line near an orchard fence line on the Clarke Farm. Brig. Gen. Hugh Mercer, a friend of the Washingtons and a resident of Fredericksburg, Virginia, attempted to reform his command, but was soon surrounded by angry British regulars shouting “Surrender you damn rebel!” Mercer, a veteran of European wars and a fierce patriot, refused to lay down his arms. After a brief struggle Mercer was bayonetted repeatedly and left for dead. Given that Mercer was well-attired (as opposed to the rags worn by most American soldiers), a high-ranking officer, and refused to surrender, many British soldiers believed they had killed Washington himself. The Death of General Mercer at the Battle of Princeton by John Trumbull captures the demise of this great patriot, but also includes, incorrectly, Washington looming over Mercer’s end. Learn more about the origins of this famous painting. 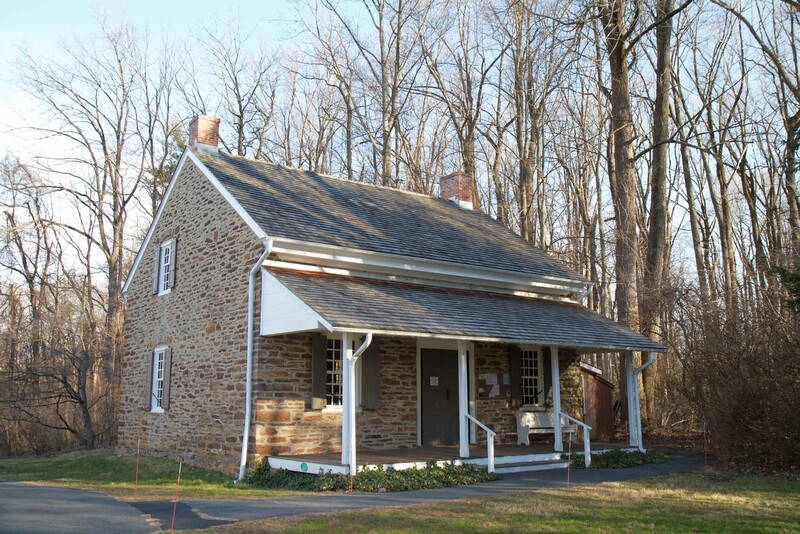 Moving to reinforce Mercer’s broken line Cadwalader’s brigade of Pennsylvania militia, Delaware and Philadelphia light infantry, and a small unit of marines – all told about 1,500 men - moved towards the British. Despite their numerical superiority, the inexperienced Americans began to fall back under the steady fire from the British regulars. As Cadwalader reformed his line, up rode Washington astride a magnificent white horse. Amidst the flying musket balls Washington coolly assured his soldiers, “Parade with us my brave fellows! There is but a handful of the enemy and we shall have them directly!” Washington then proceeded to lead the militiamen forward from the front. He at one point was only 30 yards from the British line – easy musket range. John Fitzgerald, one of Washington’s officers, reportedly pulled his hat over his eyes, expecting to see the General shot from the saddle at any moment. Despite his proximity, Washington remained uninjured and his galvanizing presence stabilized the American line at a critical moment in the battle. Soon Washington, along with fresh reinforcements, were chasing the remnants of Mawhood’s broken force through the fields and woods. After his arrival upon the Pennsylvania shore of the Delaware River, Washington sent out an urgent plea for reinforcement. One of the first contingents of soldiers to respond to this request were roughly 600 Marines from the Philadelphia area. This force of Marines had been recruited for duty aboard the various Continental warships now anchored near Philadelphia and were generally considered to be excellent fighters. All of the Marine officers had seen active duty against the British onboard various vessels and their men had been occupied in daily drill and frequent skirmishes with British forces operating in the area. 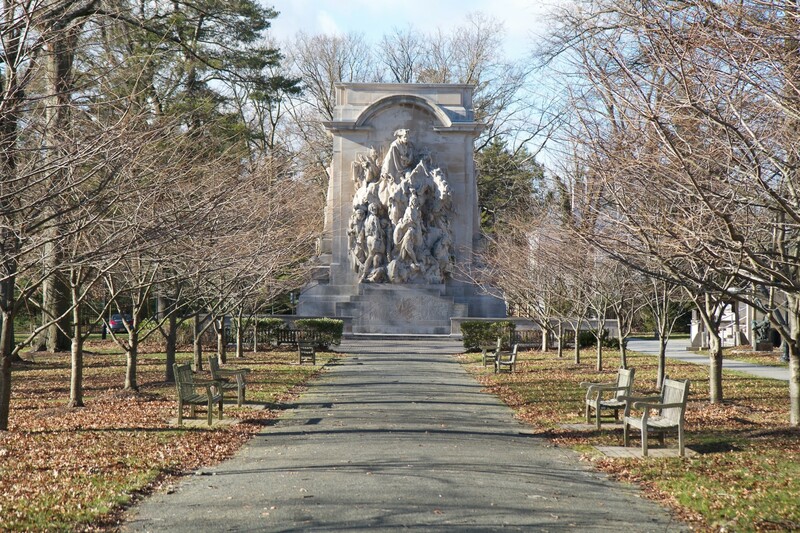 Three companies of United States Marines accompanied Washington’s army on its nighttime march to Princeton. 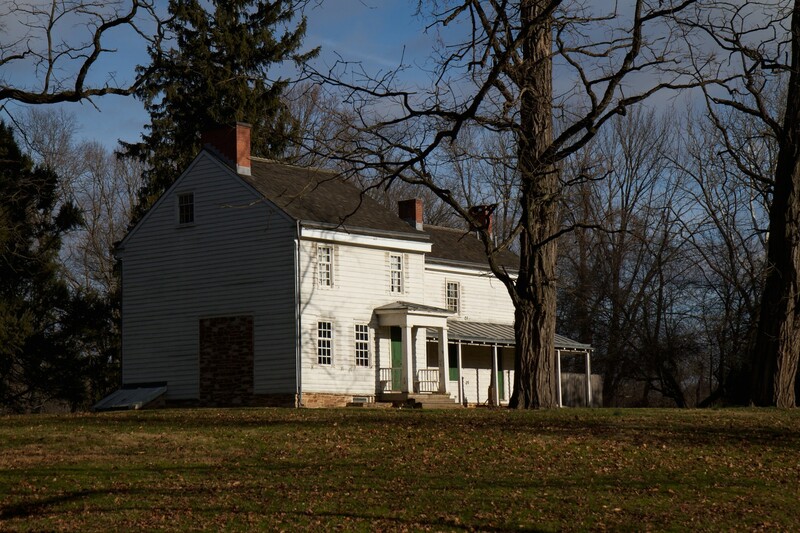 Moving with Cadwalader’s Brigade into the fight, a few marines under the command of Major Samuel Nicholas, engaged Manhood’s troops on the Clarke Farm. During the fierce fighting the Regulars several of the marines were killed in battle, including Captain William Shippin. These casualties were some of the first to be suffered by US Marines on any battlefield. 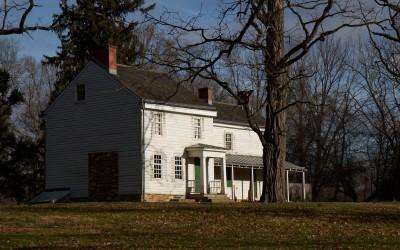 After the American victory on the Clarke Farm, the final military actions of the Battle of Princeton shifted towards the town itself. Roughly 200 British Regulars had fortified Nassau Hall at the center of what is Princeton University today. From this stout building the British intended to use firing positions to hold off the Americans until a relief party arrived. The Americans positioned cannon around the building and soon began firing on the building and its occupants. Legend has it that one of the American cannonballs decapitated the portrait of King George II hanging inside the building – a fearful omen that further spurred the British garrison to surrender. Nassau Hall still stands at the center of Princeton University and one can still see upon its surface damage caused by the American fire. As for the portrait of King George? Well the original portrait was destroyed, but a different painting of King George II now hangs in the historic building opposite Peale's portrait of George Washington at Princeton. The disastrous defeats in the 1776 New York Campaign and the precipitous retreat across the Delaware had left the prospects for American independence in tatters. 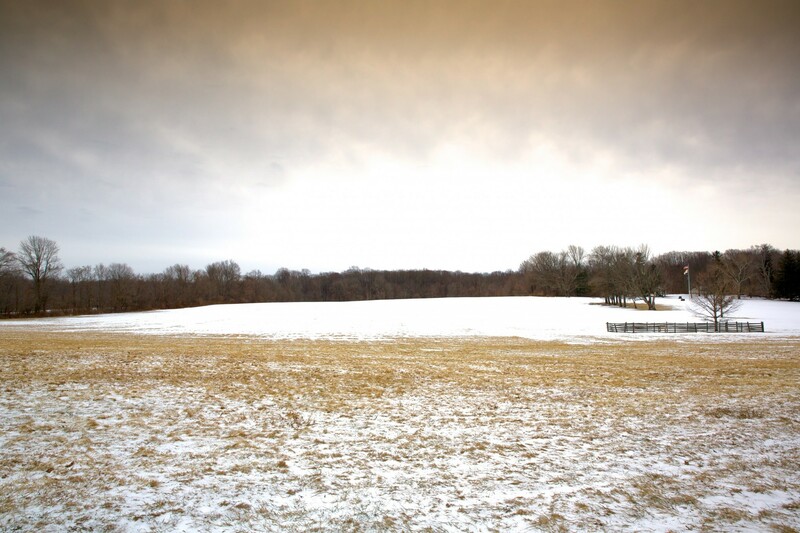 Rather than retreat to winter quarters as most on both sides of the Delaware River expected, Washington chose to attack in the dead of winter. Washington’s victories at Trenton, the Assunpink Creek, and at Princeton completely reversed the fortunes of the Continental Army and the prospects for the young United States. Washington’s victories and the effective guerrilla war waged in the New Jersey countryside forced Sir William Howe to retract the British lines back towards New York City - giving up much of the Jersey countryside that had been captured earlier. Many look at the battles of Trenton and Princeton as small affairs, but these battles, combined with the tough winter campaigning sliced Howe’s once mighty army in half. Howe’s further requests for reinforcement left many in London aghast. Washington’s bold gambles and effective leadership had delivered the very sort of public confidence that Washington was keen to produce. Not only were the British and the Loyalists discouraged, but his own soldiers found newfound confidence that they could beat the very best that the British could put into the field. Given how the news of Washington’s victory at Princeton had electrified the nation, it’s not surprising that the leading artists of the day hoped to capture Gen. Washington on canvas. Charles Willson Peale, Washington’s most frequent portraitist and a Continental Army veteran who was at Princeton, finished his George Washington at Princeton painting in early 1779. The painting had been commissioned by the Supreme Executive Council of Pennsylvania for its council chambers in Independence Hall, Philadelphia. After the painting’s debut there was a great clamor for replicas. It is estimated that Peale created 18 or more different replicas of the painting for clients as varied as King Louis XVI, the Spanish Court, and the island of Cuba. Today replicas can be found at Princeton University, the Metropolitan Museum of Art, Colonial Williamsburg, the Virginia Museum of Fine Arts, the Cleveland Museum of Art, and the US Senate. Each of these copies employ different sized canvases, updated uniforms, varied backgrounds, and other modifications. 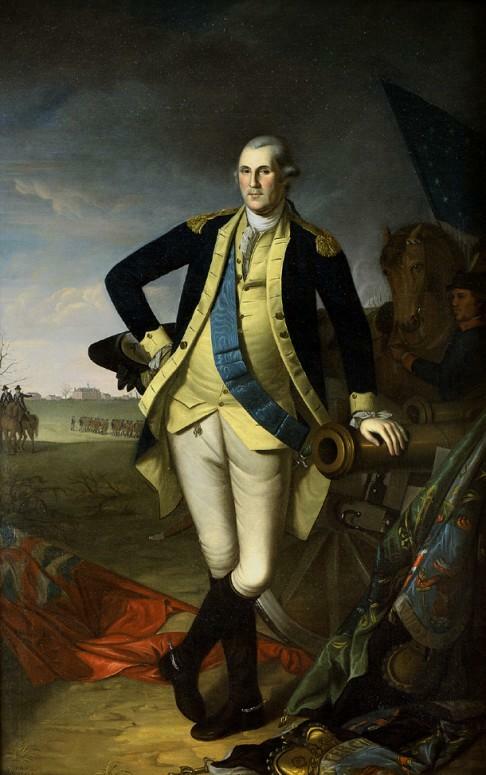 In the original painting, now a part of Pennsylvania Academy of Fine Arts collection, Washington leans upon the barrel of a captured cannon while Hessian and British flags lie at his feet. 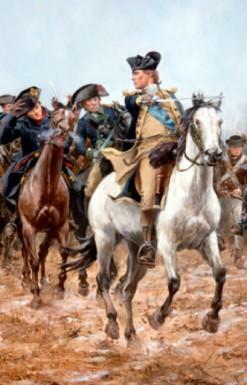 Washington is his blue and buff uniform with commander’s sash looks confidently at the viewer while in the background one can make out Nassau Hall - scene of the final moments of the battle. Weather: 21 degrees at 8am - "Fair & frosty." 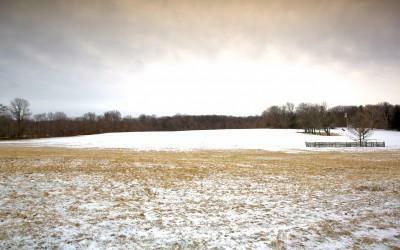 Some reported "shin deep snow" on the Clarke Farm battlefield. Troop Strengths: American - 4,500 est. with 35 artillery pieces. British - 1,200 est. with 6 to 9 artillery pieces. Casualties: Exact numbers are not known and estimates vary. Fischer reports 232 killed and wounded for the British with maybe another 200 to 300 captured. American losses were likely 31-37 killed, upwards of 37 wounded, and 1 captured. 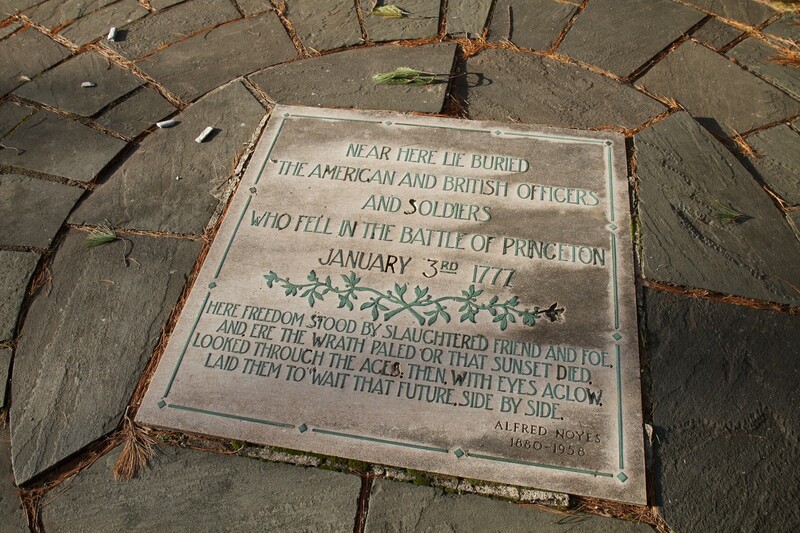 At the time of the battle, Princeton University was known as the College of New Jersey. 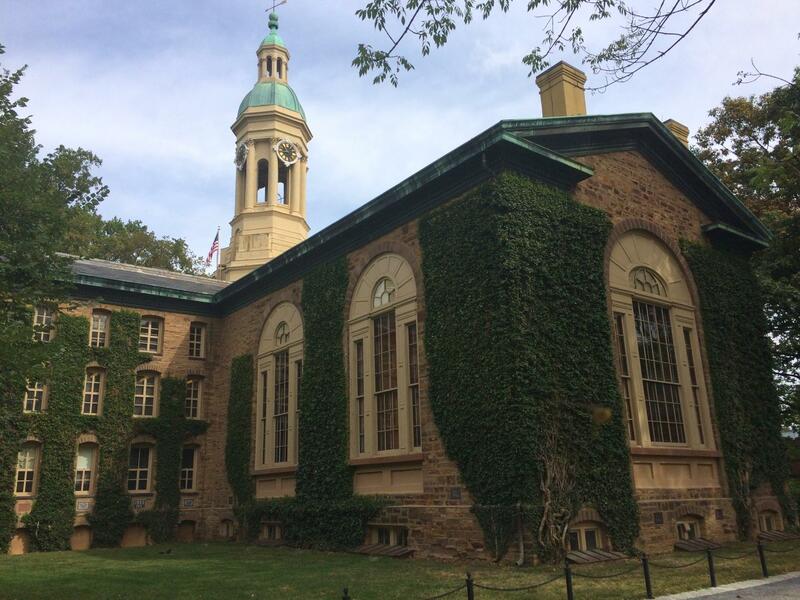 The name was changed to Princeton University in 1896. The Continental Congress convened in Nassau Hall from June 30, 1783, to November 4, 1783. Congress moved here from Philadelphia to avoid the risk of mutinous Continental army officers in and near Philadelphia. Edwin N. McClellan and John H. Craige. Marines in the Battles of Trenton and Princeton, 1921. United States Senate, George Washington at Princeton. Saint Peter's Church, What the Walls Can Tell Us. Library of Congress, Map Division, Plan of Princeton, Dec. 31, 1776. Campaign 1776, Battle Map of Princeton. Watch Washington's attacks on Trenton and Princeton unfold in this video presentation. 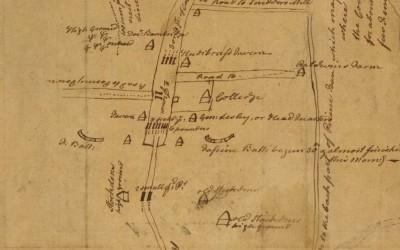 View our new map on the opening phases of the Battle of Princeton, January 3, 1777. 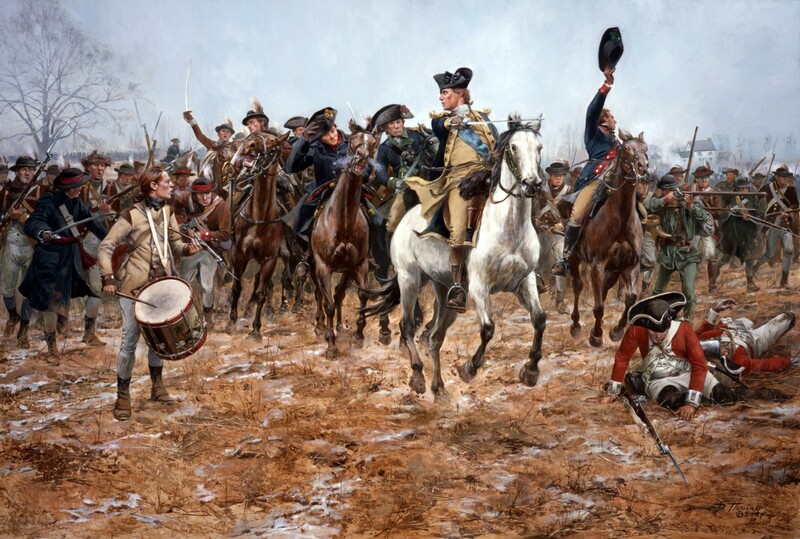 Follow the action at the Battle of Princeton at the time of Washington's charge.